This spinning wool kit features resources for how to spin wool, from selecting a sheep fleece and preparing the fiber to knitting with handspun yarn. Want to learn how to spin wool? Or do you want to go even deeper with your wool spinning? This kit is the perfect collection for you. It brings together two DVDs, an eBook and a book to get you from raw wool to finished knitted pieces. Get these four resources for only $59.99! That's a savings of over 40%. Carding wool is the first step towards easy spinning and consistent yarns; however there is no one way to card wool. These four master spinners each give their own techniques for carding, ranging from deeply traditional to somewhat eccentric. They all work. This eBook is a comprehensive review of the characteristics of wool from over a hundred breeds of sheep. 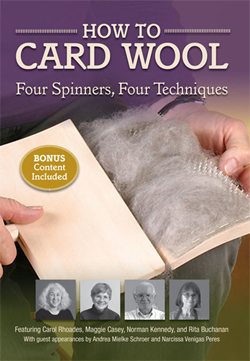 This is a indispensable resource for anyone wanting to spin wool. Actual fleece locks are shown in full-size photographs, and knitting, crochet, weaving, and other techniques illustrate the importance of matching wool type to end use. Everything from baby-soft Merino to silky Lincoln and sturdy Karakul - the full range of nature's miracle fiber - is represented here, with special attention given to fleece characteristics and to methods of preparation and spinning. You'll find expert advice on: selecting top-quality fleeces; cleaning wool efficiently and thoroughly; teasing, flicking, combing, carding, and other preparation methods; and spinning and plying a variety of yarn styles. 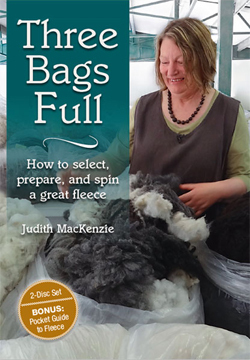 Master spinner Judith MacKenzie offers in-depth instruction on selecting, preparing, and spinning a great fleece in this four-hour comprehensive video! 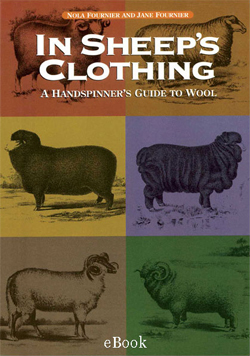 This is an ultimate guide for any spinner wanting to gain more knowledge about spinning wool. 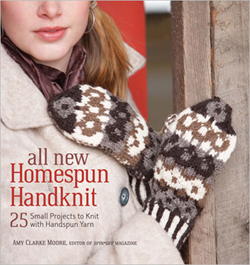 All New Homespun Handknit features beautiful quick-to-knit projects that use just a few hundred yards of handspun yarn. These knitting patterns show off the unique colors and textures only found in yarn created by hand. Knitting with handspun wool has never been easier with this book! Hurry! We have a limited supply of this kit so order yours today while supplies last.